Matt Lewis, from Coles Miller Solicitors, urged students to gain work and life experience but also enjoy themselves when he spoke at Parkstone Grammar as it signed up to Dorset Chamber of Commerce and Industry’s (DCCI) Young Chamber Programme with sponsorship from Coles Miller. The 28-year-old also revealed to students that he was just about to be made a partner at the firm – the youngest in its history just five years after joining as a trainee solicitor. He also urged pupils to “go with it and enjoy” their journey through education and work in building a career. Matt, who studied in Southampton and Bournemouth at undergraduate and postgraduate level, will lead the Young Chamber Programme for Coles Miller Solicitors. He was accompanied by the firm’s managing partner Adrian Cormack and marketing manager Sarah Ryan. DCCI chief executive Ian Girling and Young Chamber co-ordinator Will Montgomery also attended along with head teacher Tracy Harris and careers co-ordinator Julia Wilkinson. 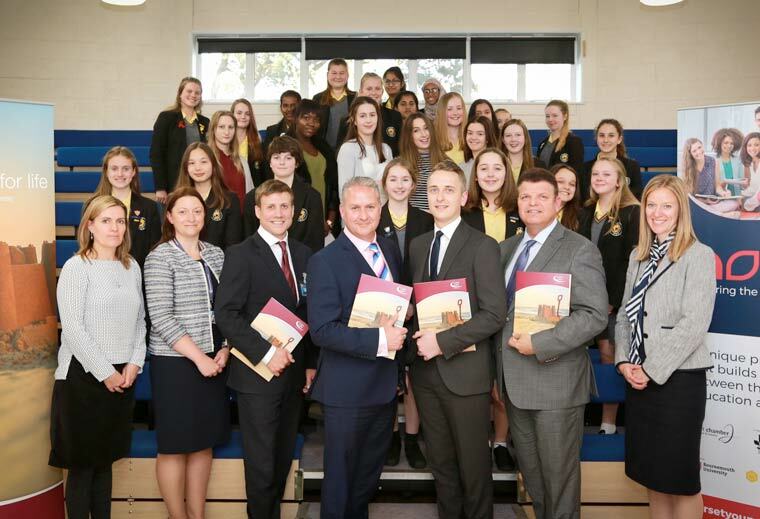 Parkstone has become the first school in Poole and the first grammar to join DCCI’s groundbreaking Young Chamber Programme, which now has 14 members. Tracy said: “We know how hard it can be for local businesses and schools to interact so the Young Chamber Programme offers many great opportunities. Will said: “Parkstone has become the first grammar and the first school in Poole to join the Young Chamber Programme. Contact Will to join the programme on 01202 714817 or email Will.Montgomery@dcci.co.uk. Follow the Young Chamber Programme on social media under #bridgingthegap.